Championing Chicken Chicken moves into stardom when chefs show it some love, developing recipes that are delicious and trend-forward. Here are three dishes that stand out—each bringing a different approach to a very familiar protein. Chicken is a fixture in the foodservice firmament, thanks to its lean profile and neutral flavor. It moves into stardom when chefs show it some love, developing recipes that are delicious and trend-forward. Evidence abounds here, with innovation driven both by a steady demand for chicken-centric dishes and the need for on-trend menu offerings. Here are three dishes that stand out—each bringing a different approach to a very familiar protein. Minigrow is a fast casual that specializes in customizable noodle dishes. But its top seller doesn’t allow for any modifications. The Chicken Jawn, says Justin Rosenberg, CEO of both Minigrow and its sister concept Honeygrow, is the perfect combination of flavorful components. “This is our star dish. Like the word ‘jawn’—this dish ‘is what it is,’ and it rewards believers with an indulgent, comforting, wholesome combination of savory flavors,” he says. This modern bowl sees fresh three-wheat noodles that are tossed in tare (a soy-based sauce) and vegetable stock, then topped with hand-torn roasted dark- and white-meat chicken, sweet-and-sour onions (roasted in oil, balsamic vinegar, clover honey), miso corn (miso, butter, ginger juice, salt), black truffle, chives and Parmesan. Chicken on a salad is certainly not a new phenomenon, but modern flavor play here makes it a memorable one. 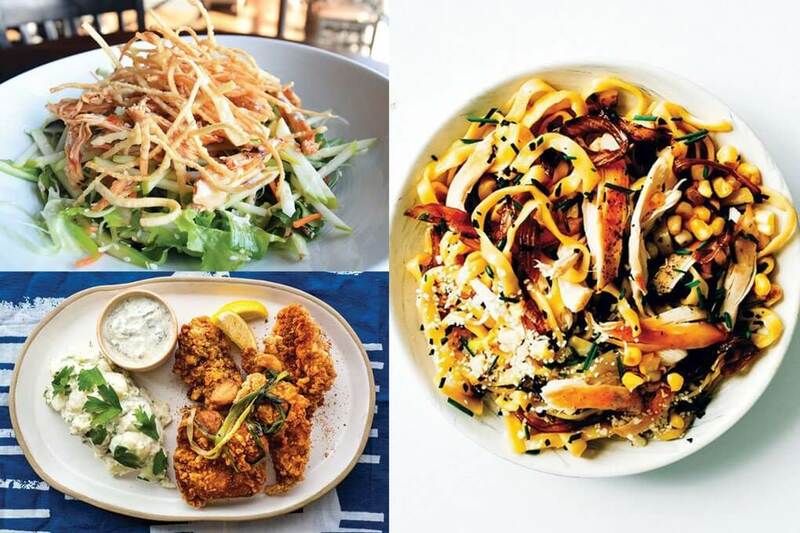 ViewHouse, a New American eatery with three locations in Colorado, menus a Wasabi & Sweet Garlic Chicken Salad that perfectly captures the opportunity in distinguishing salad offerings. Introduced originally as a salad feature on the summer menu, the offering quickly became a fan favorite and has since gained permanent status on the menu. Starring mixed greens, scallions, celery, carrots and Granny Smith apples, it’s tossed in a housemade wasabi-aïoli dressing and topped with local, organic chicken marinated in housemade sweet chile-soy sauce. Crispy wonton-skin slivers finish the salad for a craveworthy crunch. “The combination of spice from the wasabi, sweetness from the sweet-chile chicken, and the freshness from the lettuce make this dish an exciting mix of flavors,” says Executive Chef Jose Guerrero. It’s impossible to talk about chicken without pulling in a great example of fried chicken. There’s so much innovation in this category, from new takes on Southern-inspired recipes to global mash-ups. Japanese-style fried chicken, called karaage, is finding a home here, thanks to its savory flavor and crispy coating. At Bessou, a modern Japanese restaurant in New York, the Chicken Karaage marries the Japanese method with Moroccan spices. “It’s a new spin on a familiar flavor and satisfies anyone’s fried chicken craving,” says Kyogoku, Owner, who developed the menu with Executive Chef Emily Yuen. The chicken is marinated overnight in soy and double fried in a traditional Japanese batter made from flour and potato starch. It’s dusted with Moroccan spices, including paprika and cumin. Katie Ayoub is managing editor of Flavor & The Menu. She has been working in foodservice publishing for more than 16 years and on the Flavor team since 2006. She won a 2015 Folio award for her Flavor & The Menu article, Heritage Matters. In 2006, she won “Best Culinary Article” from the Cordon D’Or for an article on offal.